Durham Academy, a private, independent day school in Durham, was begun in 1933 by Mrs. George Watts Hill for the education of her children and the children of her friends. The school initially included only a kindergarten and a few lower grades, but it gradually grew until all 12 grades were offered in 1972. In its early years the school used the method of instruction devised by the successful Calvert School of Baltimore, Md., and was called the Calvert Method School. The first headmistress was Margaret McGary, previously principal of the public Morehead School in Durham. Initially, classes were held in the Forest Hills neighborhood clubhouse, but with the addition of grades and students, more space was required. The Hills provided the former John Sprunt Hill residence on Duke Street, where the school remained until 1965. In 1957 the school broke its ties with the Calvert School, and two years later its name was changed to Durham Academy. In 1965 it moved into new buildings on a larger tract of land, and in 1972 it moved the high school grades to an even larger campus in a semirural setting. The first high school class graduated in 1975. George Watts Hill and Frank Kenan made generous donations for endowment and other needs, including a program for children with learning disabilities, open to all schoolchildren. By the early 2000s Durham Academy enrolled approximately 1,100 students in grades prekindergarten through 12 on three campuses and operated the Hill Center for children with learning disabilities. Jean B. Anderson, Durham County: A History of Durham County, North Carolina (1990). 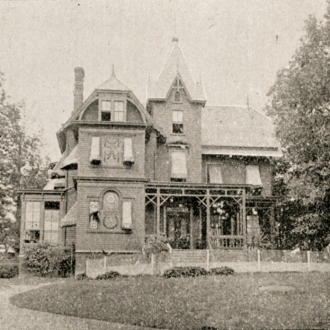 (Click for more images and information) First Durham Academy building, South Duke Street, built in 1880. Image courtesy of Open Durham. Available from http://www.opendurham.org/buildings/first-george-watts-house-calvert-durham-academy (accessed November 5, 2012).